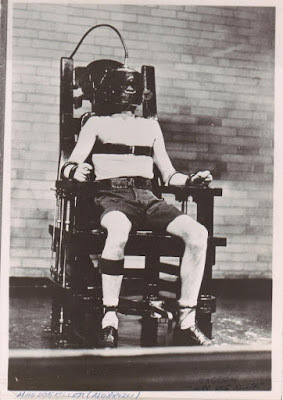 Stephen W. Terrell's (MUSIC) Web Log: THROWBACK THURSDAY: Send Me to the 'Lectric Chair! THROWBACK THURSDAY: Send Me to the 'Lectric Chair! These, of course are the opening lines of "'Send Me to the 'Lectric Chair," a black-humor ditty recorded in 1927 by The Empress of the Blues, Bessie Smith. The song, credited to George Brooks -- which was a pseudonym for Fletcher Henderson, the influential bandleader and music director. This is one of many tunes he wrote for Bessie. But it's the most memorable. The woman in the song is begging the judge to send her to the chair because she knows she has to reap what she's sown. Yep, by that time he probably was ready to send her to the Devil down below, just like she requested. In 1958 Dinah Washington released an album called Dinah sings Bessie Smith. " 'Lectric Chair" was on it. Below is a TV performance by Washington. I don't know which show it is but it's sometime after her Bessie album was released. Here's a live 1977 performance. And somehow this funny little song of crime and punishment led to a very short but very strange 2009 film of the same title directed by Guy Maddin and Isabella Rosselini. Actually the film doesn't seem to have much to do with the tune -- except the fact that a snippet of Bessie's song comes in briefly at the 1:31 mark.